Commercial Passenger Vehicles Victoria issues a Multi Purpose Taxi Program (MPTP) smartcard to accredited commercial passenger vehicle drivers who nominate they will be providing unbooked services. At the start of each shift, these drivers must log on to the approved electronic transaction terminal in their vehicle that’s compatible to process MPTP payments. The driver must remain logged on at all times during their shift and log off at their shift’s end. 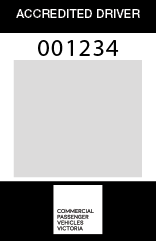 The smartcard shows the driver's name, driver licence number and driver accreditation number. Drivers who require a replacement smartcard can apply for one by contacting us. You can have your new card sent to you in the mail, or pick it up from the Customer Service Centre (CSC). If you wish to collect your card from us, it will be available from the CSC at Lower Ground Floor, 1 Spring Street, after 10.30 am on the following business day. You’ll need to bring photo identification, such as a valid Victorian Driver Licence. 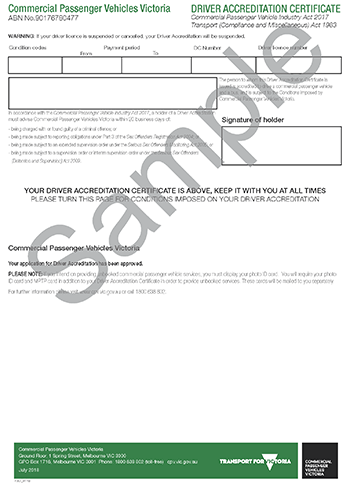 When we accredit you, we’ll issue you with a driver certificate. All commercial passenger vehicle drivers must carry their driver certificate with them whenever they are driving. contacting us using one of the following options available on contact details page. If you are driving a commercial passenger vehicle that provides unbooked services, you must ensure your photo identification card is clearly visible at all times while driving. Contact us to arrange a replacement.